Sometimes, that wine stain simply doesn’t come out or the sofa simply has too much sentimental value to throw away after all these years. When this occurs, the repair of that furniture falls in part under the umbrella of the upholsterer. Responsible for the production, replacement, and repair of the various materials that cover furniture, usually seating, the domain of the upholsterer ranges from the sofa to the interior of a car or truck. Given furniture is part of fashion, upholsterers tend to be with current trends and are quite adept at consulting with others involved in the creation of custom homes and vehicular alterations to produce the best possible outcome. Though there are no formal postsecondary requirements to becoming an upholsterer, various vocational schools and community colleges offer courses in upholstery for those looking to have an edge in the industry right out of the gate. Given this is a craftsman position, there is no formal continuing education required of an upholsterer. In keeping with the simplicity inherent in careers of this nature, once a career is begun, all education in the field is typically done through doing the job itself. This makes the profession cheap and easy to maintain once already begun. As a skilled craftsman profession, the upholsterer should expect to ply his trade throughout his entire career; there really is no administrative out for the upholsterer. Regardless, the upholsterer can eventually expect to become a foreman of sorts and become the authority on a particular project. Specialization in more and more fiddly details should also follow with experience. Though the job itself does not change considerably over the course of an upholsterer’s career, the money does properly reflect the skills acquired over that same period. The Bureau of Labor Statistics quotes the median annual wage for the profession to be $29,960, while the top 10% of earners, the most successful entrepreneurs and most seasoned veterans of the trade, earn some $46,350 annually. A 50% increase in wage for a seasoned craftsman is difficult to beat in all other like industries that do not find ways to associate themselves with construction or the medical field, thus making upholstery one of the few ways to be a successful craftsman that is not dependent on one of these two industries and can, therefore, be a successful independent operator without significant problems. Although the Bureau of Labor Statistics quotes the average rate of growth for all industries to be 14% from 2010 to 2020, it is expected that there will only be 4% more upholsterers in 2020 compared to 2010. This growth is influenced by a number of factors. 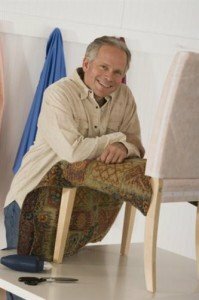 First, given the economy and the frugality it has influenced in the American people, those who have high quality furniture will be more likely to get their older furniture repaired rather than simply replacing it. Secondly, the low ebb of craftsmanship brought about by the present throwaway economy is causing there to be a resurgence of interest in antique furniture, some of which will be repaired before use. Working against these two positive factors is the throwaway consumer mindset itself. Given this mindset, many consumers will purchase products with a smaller price even though the product is not designed to last nearly as long. Once the product is damaged, a new product is cheap enough to procure that an upholsterer is a good idea. To this end, the profession of upholsterer can do well despite the poor growth forecast by establishing itself in well-to-do areas that are more wont to follow the first and second trends while avoiding the third.